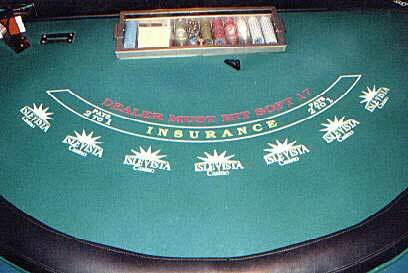 Isle Vista casino offers fun Blackjack games as well as great rules. My companion and I really enjoyed playing at one of their 2 dollar tables. We were surprised to find plenty of 2 dollar spots open on a very busy night with many exciting promotions going on. The Blackjack department is very organized and keeps up well during the busy hours. The dealers are both friendly and well trained. We really enjoyed the pace of the dealers. Nice and smooth without forcing more speed than necessary. I found the dealers to be easy to talk to and more than willing to guide the newer players. Isle Vista does hit soft 17, they offer 2 and 4 decks as well as 2 deck pitch Blackjack. Everyone seems to have a great time at Isle Vista Casino, in fact our fellow players were one of the most fun casino crowds I've ever experienced. We all talked together as if we expected to meet each other. Even the employees are fun to mingle with; they seem to love working with the public. All of my readers are invited to e-Mail me personaly.